Edit October 22 - Essie is trying to make it right and is sending everyone who entered the contest a $10 off coupon. You should receive an email with an apology, and an explanation that any information that you provided them will be deleted. 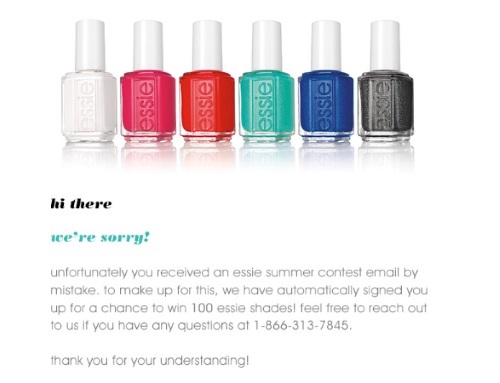 Edit October 21 - Essie sent out a follow up email today informing people that the winners email was sent by mistake. Did you get this email too? 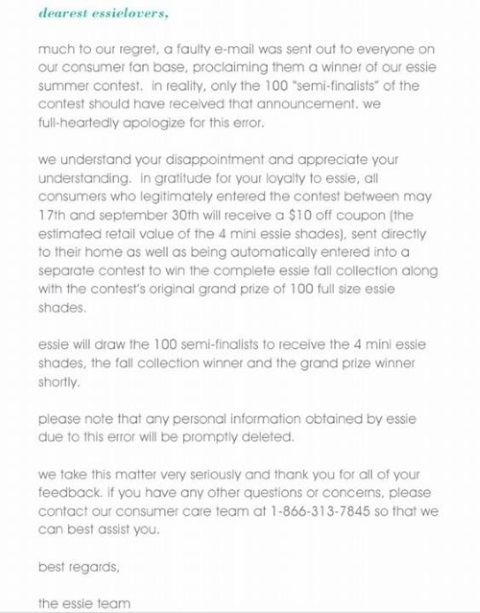 Essie also posted an update about the issue that occurred on their Facebook page here. Edit October 20 - Check your emails! Winners were notified today by email. Follow the link in the email to provide your emailing address (by November 2) for the prize to be sent to you! Prizes will ship in 4-6 weeks! I was chosen as a winner, hope some of you were too! 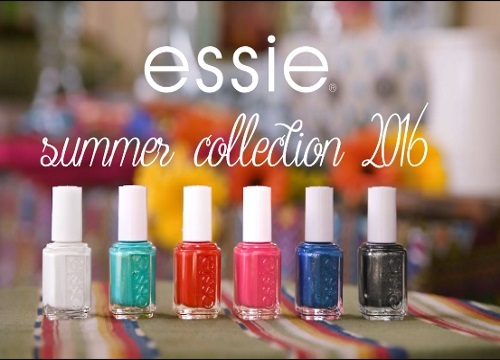 Originally posted June 26 - Essie is giving away a collection of 100 nail polishes ($999 value) and 100 prizes of a 4 set mini nail polishes Summer 2016 collection. After you sign up at the link below, scroll down to the bottom to see the entry for the contest. Contest closes September 30, 2016. Did you get the $10 off coupon email? they are also removing any info that we submitted when we got the email saying that we won, so that's nice of them to do.